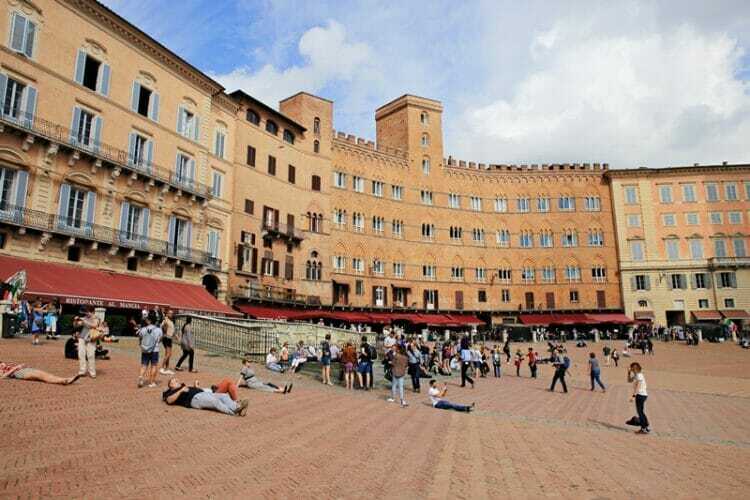 Siena is a stunning city in the heart of Tuscany that has preserved its medieval charm and architecture. 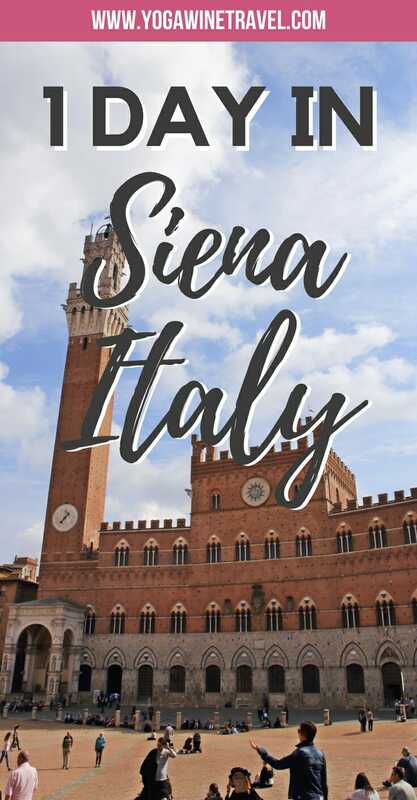 Though many return visitors to Italy opt to stay a few nights in the historic centre of Siena, it is easy to visit Siena as a day trip from its Tuscan neighbour, Florence. Siena is unique in that it was developed across three hills with three streets that form a “Y” shape and meet in a valley that is now the main city square, the Piazza del Campo. 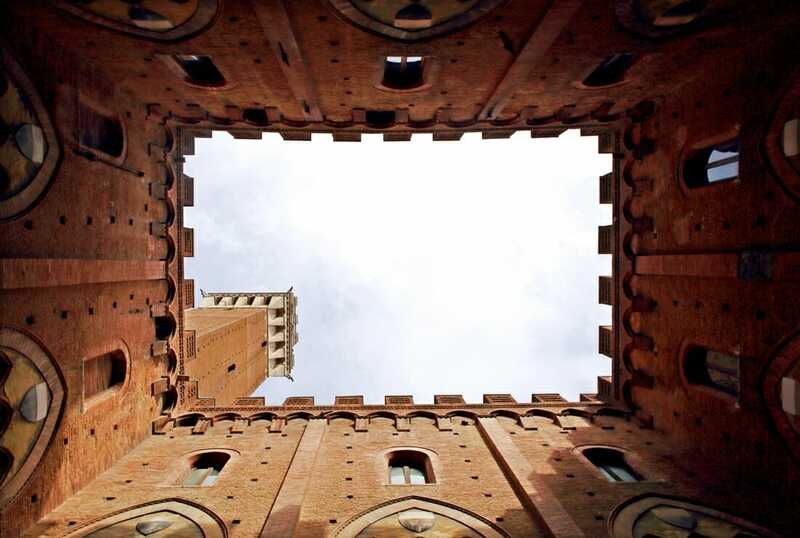 At the center of the piazza is the Torre del Mangia, a fortress tower that offers sweeping views across Siena. If you’ve traveled around the city of Florence and visited Brunelleschi’s Dome, venture a little further into Tuscany and explore Siena! Read this first: First time to Italy? 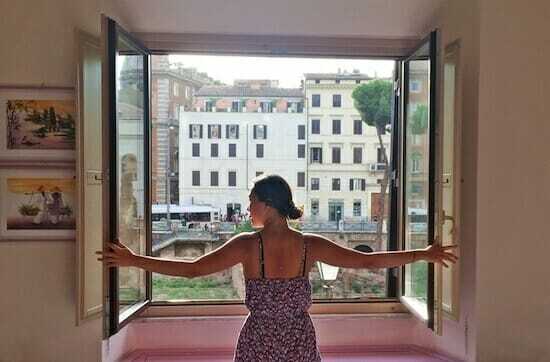 Click here for 14 things you should know before your first trip to Italy! 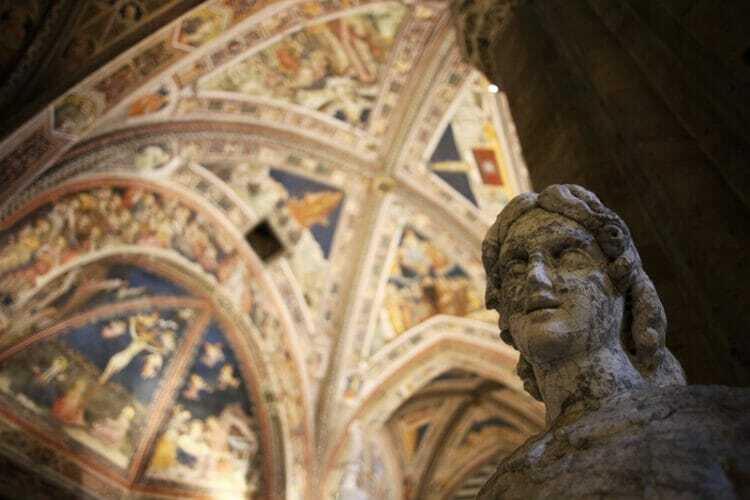 By train: A day trip from Florence to Siena is easy as pie via train. 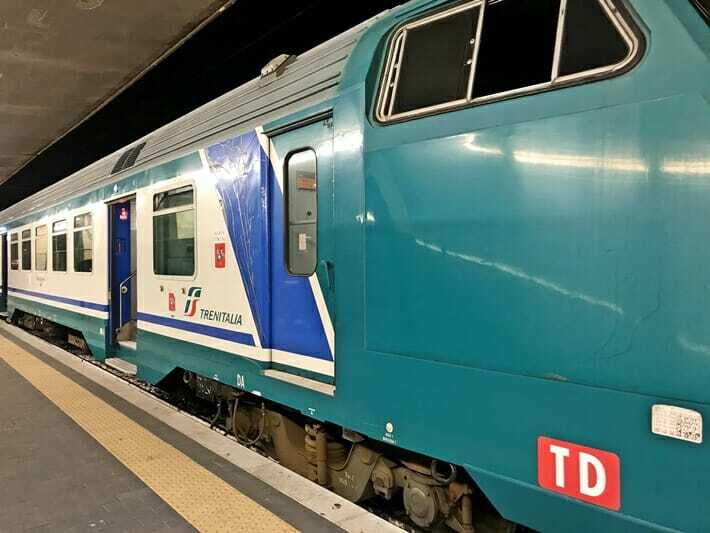 Direct regional trains to Siena leave from Florence’s Santa Maria Novella station every hour or two, and take just under an hour and a half to get to Siena’s main station. The train costs approximately 9 Euros. You can check the train timetable here. 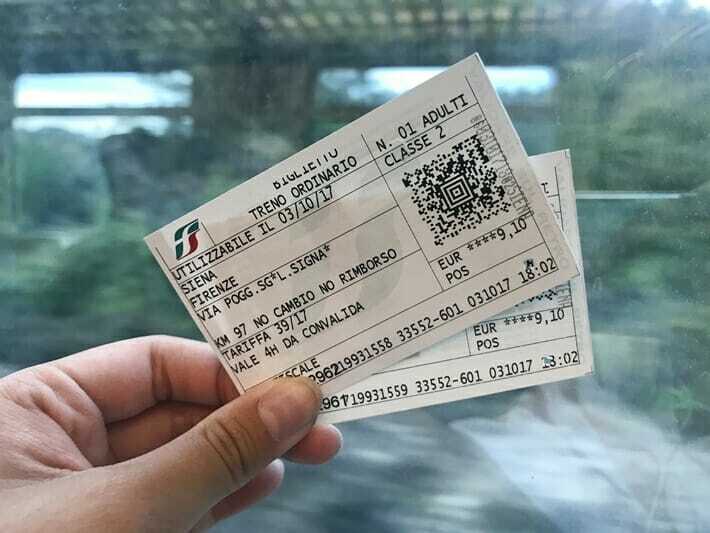 Did you know that you should validate your train ticket in Italy if there is no assigned seating? Click here for 14 things you should know before you go to Italy! From the train station, head into a Tabbacheria (newspaper stand) and ask for 2 bus tickets (1 for your return journey); each ticket will cost 1.2 Euros. Catch a bus to Viale Garibaldi/Piazza Gramsci and then walk to Piazza del Campo. Alternatively, cross the street to the other side of the road from the station and take the escalator up to Viale Vittorio Emanuele II. From there, you can also hop on a bus or walk to Piazza del Campo in 20 minutes or so. To get back to the station, walk over to San Domenico (about 10 minutes from the Duomo di Siena) and hop on the S10 bus. Remember to validate your ticket! 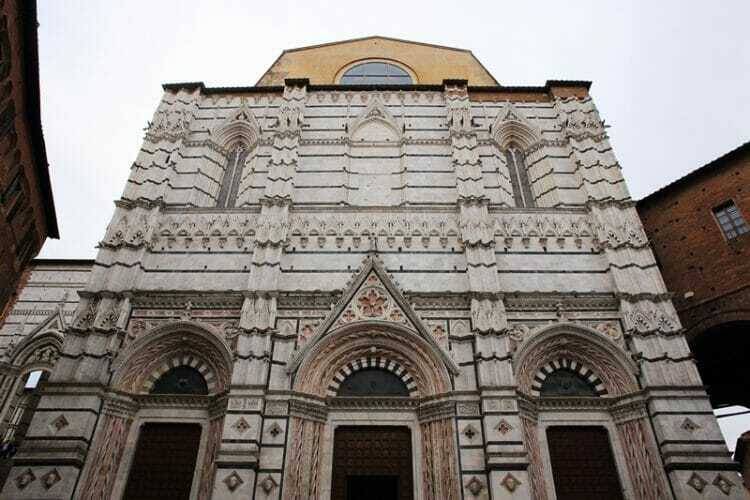 By bus: The bus to Siena also leaves from outside the Santa Maria Novella station in Florence, and costs approximately the same as a train to Siena. The 131R R is the express bus from Florence to Siena (timetable here) and the 131R A will take you back to Florence (timetable here). The benefit of taking the bus is that it goes straight to Piazza Gramsci which is closer to Piazza del Campo than the train station. Related post: Looking for other incredible day trips from Florence? Click here for some tips on how to visit the Leaning Tower of Pisa and the other monuments in the city! I’ve visited Florence a handful of times and these are the hotels that I find myself coming back to. 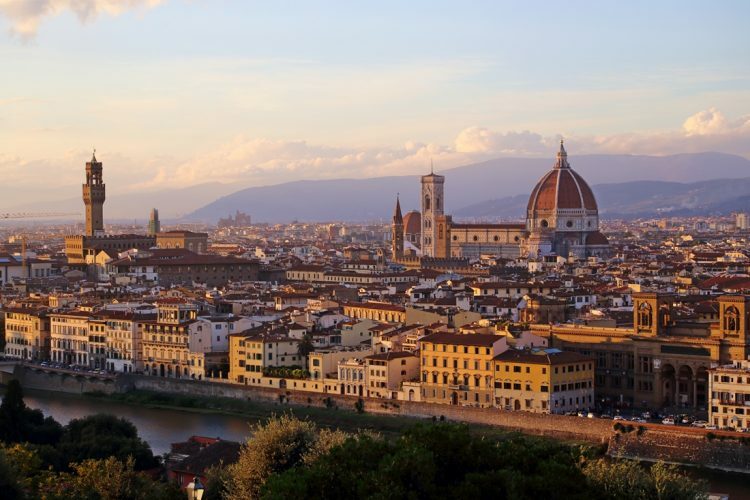 You can also click here for other highly rated hotels near the Duomo in Florence. Hotel Calzaiuoli is a 2 (yes, TWO!) minute walk away from the Duomo Complex. I’ve now stayed at Hotel Calziuoli a total of 3 times because the staff are extremely friendly and accommodating, rooms are bright, comfortable and spacious, and the breakfast spread was amazing. Click here to book your stay at Hotel Calzaiuoli! 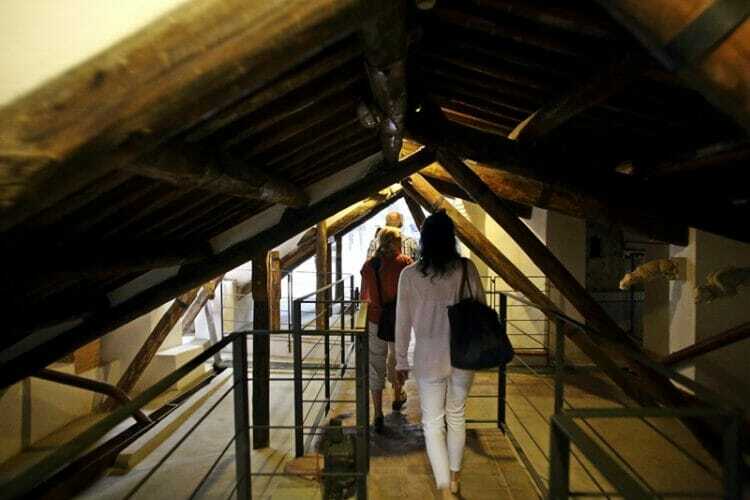 La Tana Dei Leoni is an amazing guesthouse right in front of the Ponte Vecchio. It was an amazing room and great value for money – I would highly recommend this over Hotel Calzaiuoli for anyone with a slightly lower budget! Click here to book your stay at La Tana Dei Leoni! 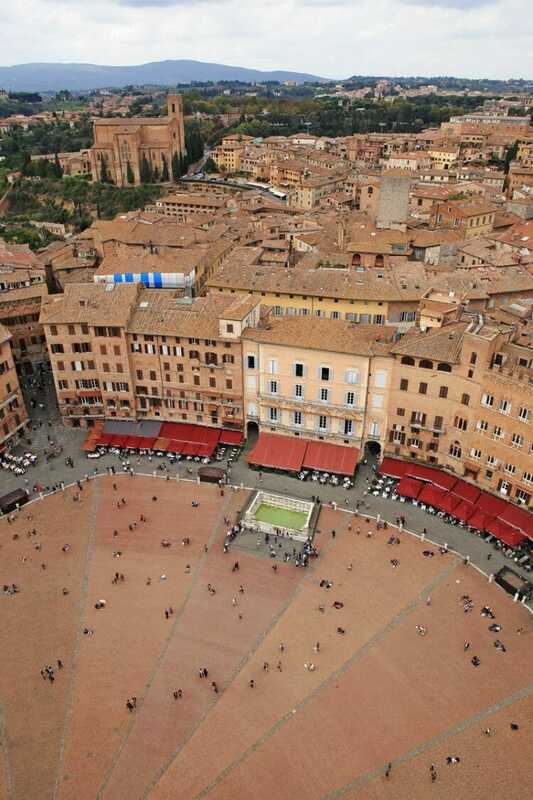 Only have time to spend 1 day in Siena? 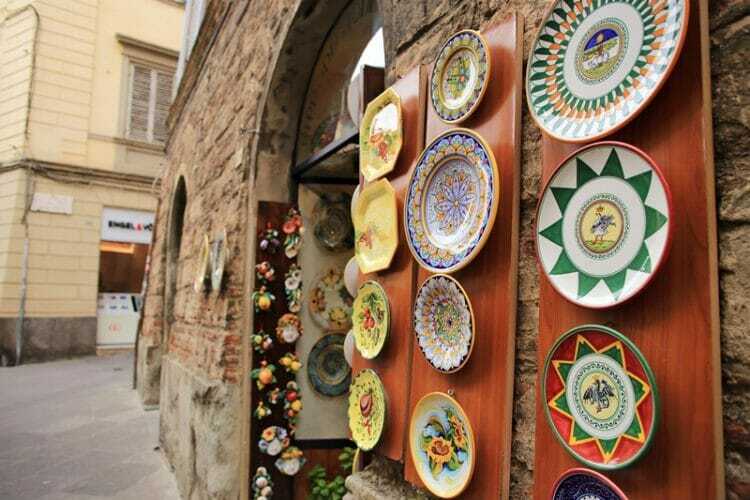 If you leave Florence in the mid-morning at 10 or 11 AM, you can arrive in time for lunch in Siena and spend the afternoon traveling around the Tuscan city. If you follow my itinerary you should be back in Florence by 5 or 6 PM. 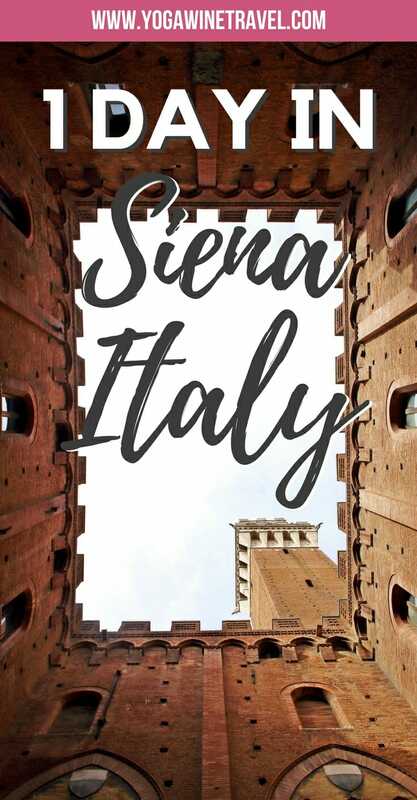 Start at the beautiful shell-shaped Piazza del Campo in the heart of the old city and work your way through Siena’s cobbletone streets and narrow lane ways on foot. Every Italian city has a city square that was the living heart of the community where people would gather for markets, events, celebrations and festivals. Today, the square is lined with tourist trap restaurants but they do have *drum roll* bathrooms! Although the food is nothing to write home about, it is a good place to grab a bite to eat and use the toilet before making the most of the rest of your day. 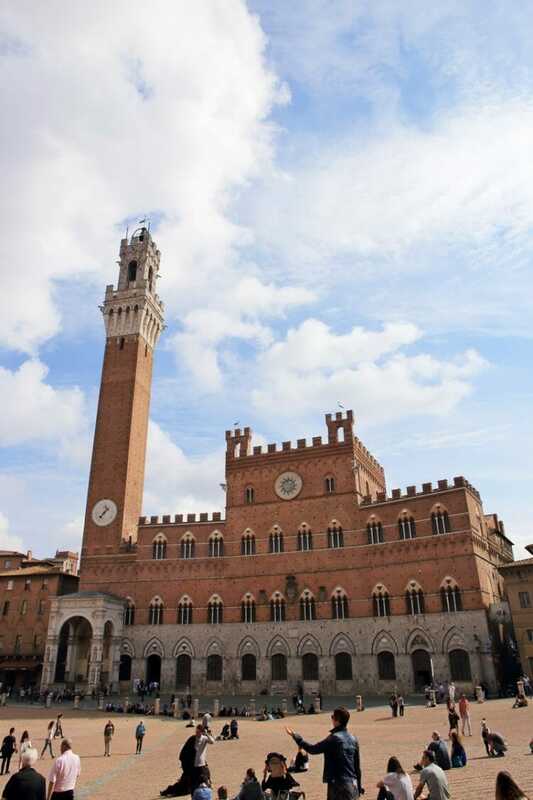 The Torre del Mangia is a striking structure standing tall in the middle of Piazza del Campo. 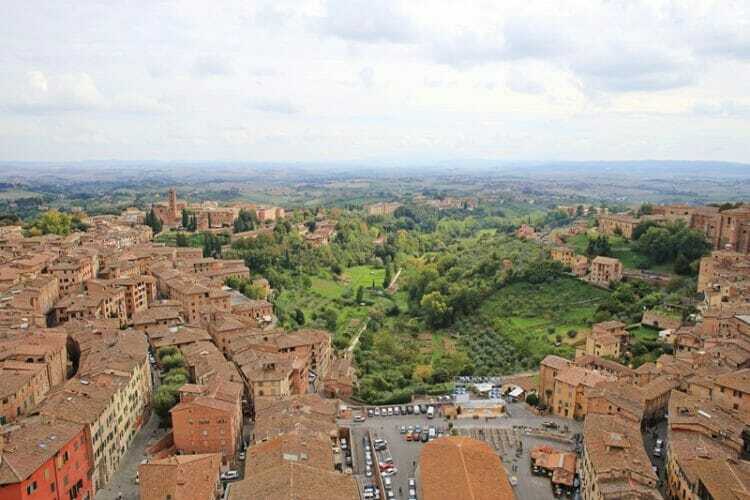 Italy has no shortage of incredible viewpoints, and Siena is no exception. The Torre del Mangia was built in the early 1300s and is 102 metres tall – its name comes from its first bellringer whose nickname was Mangiaguadagni, meaning “profit eater” as he often spent all of his earnings on food and drink. 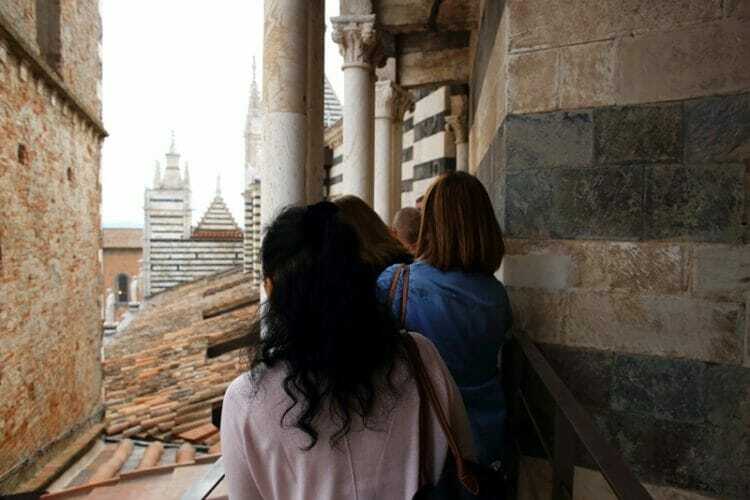 There is a narrow stairway that takes you up the tower, and there is a limit of 25 people at a time on the viewing platform. 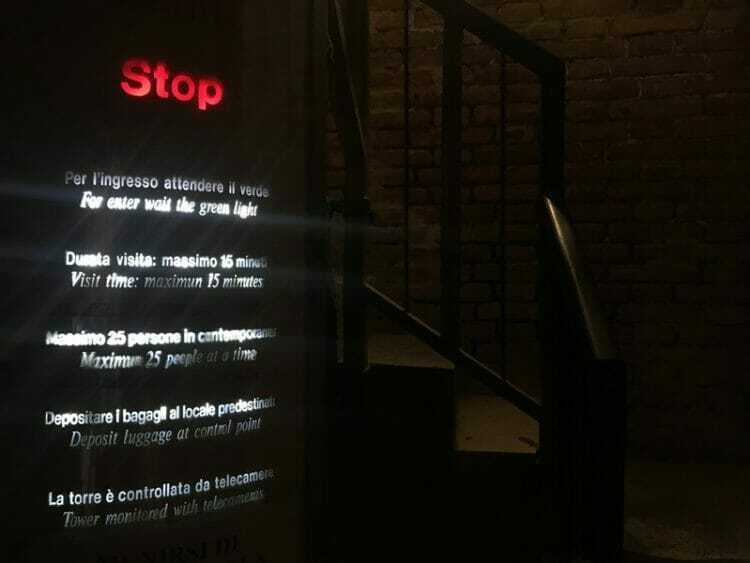 At the base of the stairway is a light that literally gives you the green light when you are allowed to start making your way up the 400 steps. Entry costs 10 Euros. Next to the Torre del Mangia is the Palazzo Pubblico which houses the Civic Museum, home to important works of art and religious objects. 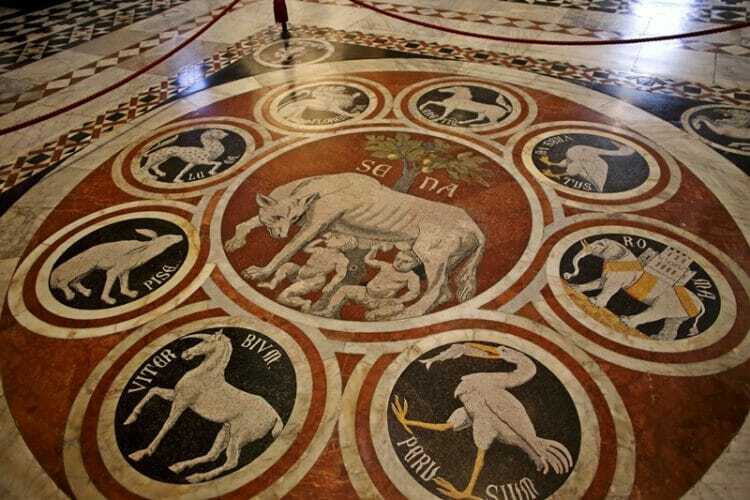 It’s worth a wander around if you have time – otherwise skip it and head straight to the Siena Cathedral. The Cathedral was built in the 13th century and has a beautiful exterior facade – once you walk in you’ll see intricate marble floors and carvings, gleaming stained glass panels and gilded altars. 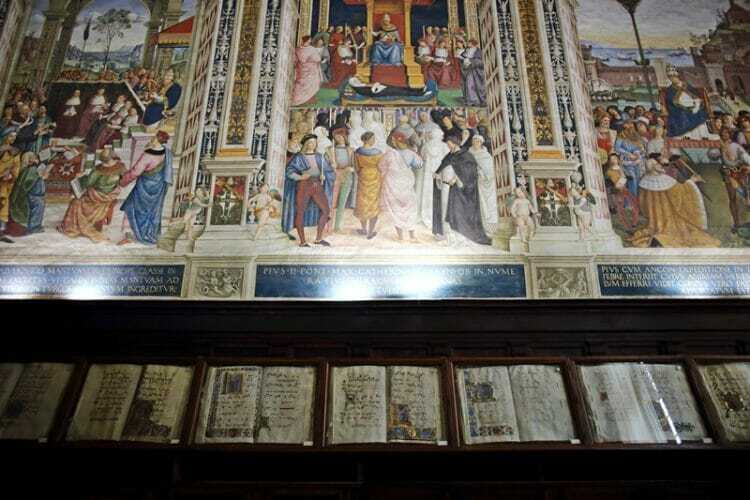 Don’t skip the Piccolomini Library, home to delicate choir books and frescoes and the panel depicting Romulus and Remus on the floor. Make sure you are dressed appropriately (shoulders and knees covered) before entering the Cathedral. 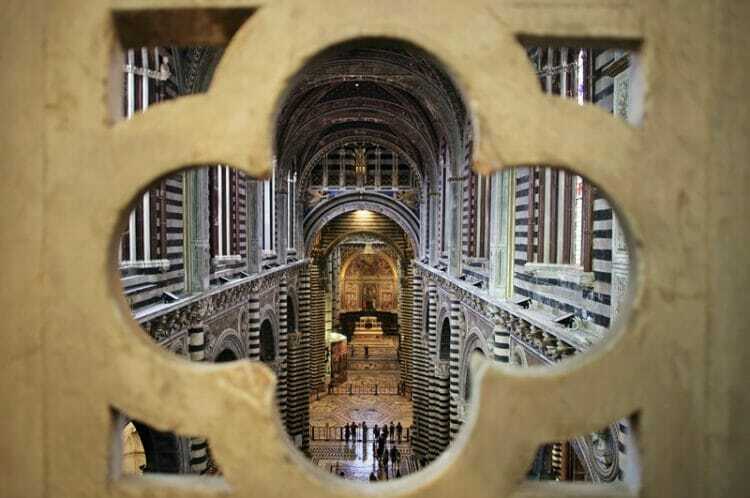 There are several ticket options for the Siena Duomo complex encompassing the Cathedral, the Piccolomini Library, the Gate of Heaven, the Baptistry, the Crypt, the Museo dell’Opera, the Panorama from the Unfinished Façade, the Oratory of St. Bernardino and the Costone Gardens. The ticket office is in front of the Cathedral. The basic ticket that grants entry into the majority of the monuments costs between 8 and 15 Euros depending on the season, but what you should really spring for is the Porta de Cielo (Gate of Heaven) tour. The Porta de Cielo ticket costs 20 Euros and allows you to join a private tour and access to the cathedral roofs, offering a unique view into the Cathedral from above. 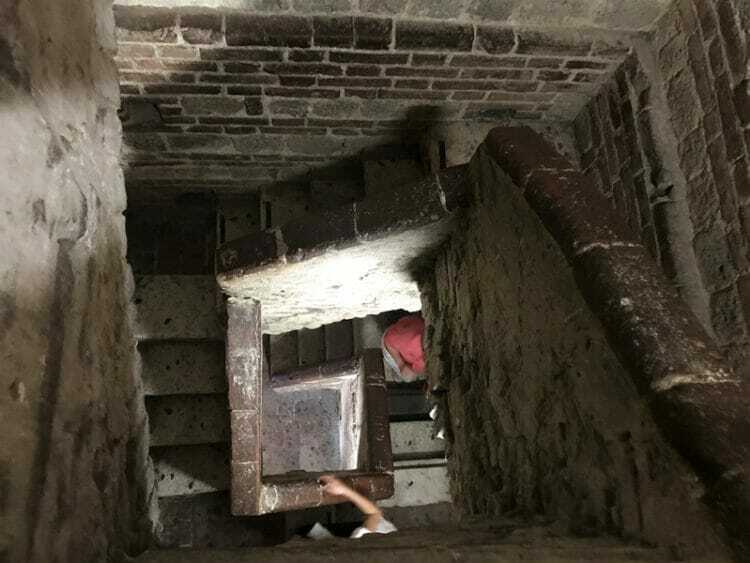 Meet at the entrance to the Cathedral before your scheduled tour – the tour takes 20-30 minutes where the guides lead you through private stairways and balconies. 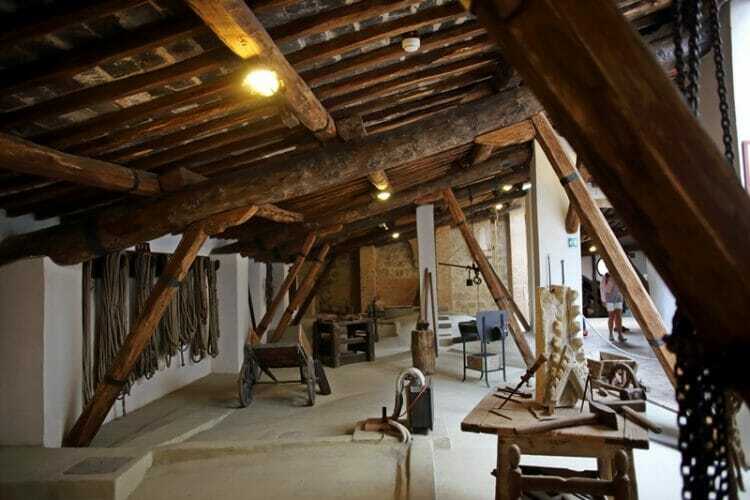 The Museo dell’Opera is one of the oldest private museums in Italy. 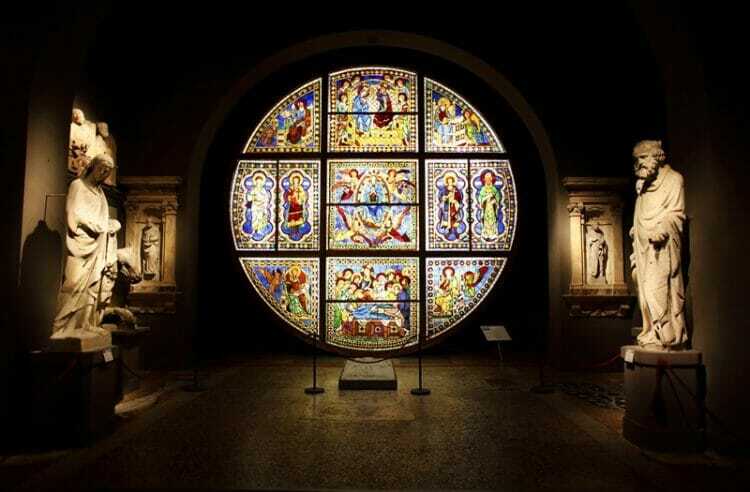 It was founded in the mid-1850s and houses antique sculptures, statues, stained glass windows, art work and treasure. 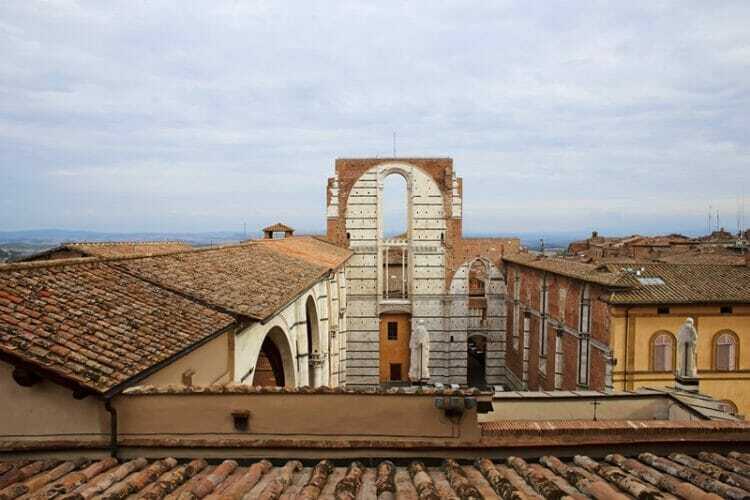 The Facciatone Panorama viewpoint is one of the most unique gems in Siena – the entry is on the top floor of the Museum and offers a breathtaking view across Siena’s rooftops. However, the wait is long – if you went on the Porta de Cielo tour, then you can opt to skip the Facciatone. There are beautiful viewpoints all across Italy – some of them bell towers, some of them in cathedrals and some are just plain ol’ amazing rooftop bars. Click here for 14 things you should know before you go to Italy! 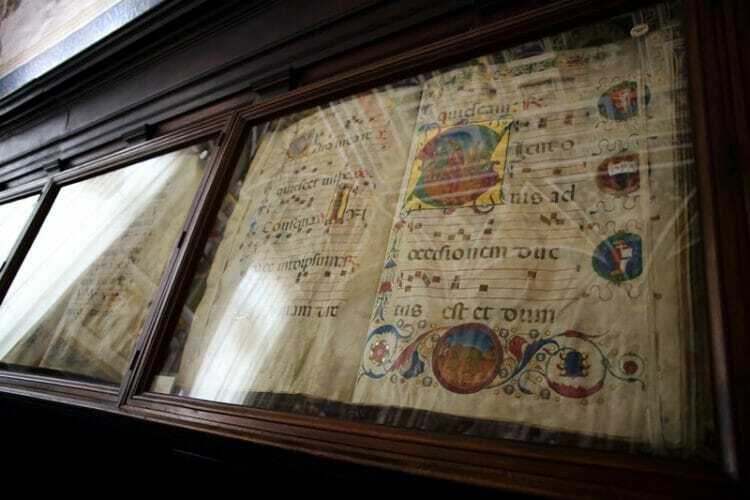 The Crypt houses 13th century frescoes and paintings that are in excellent condition. 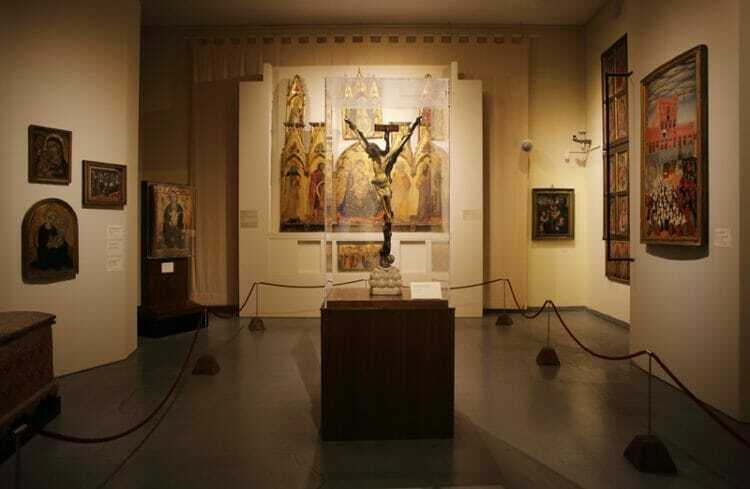 The religious artwork depicts the nativity scene, the deposition from the cross and so on. 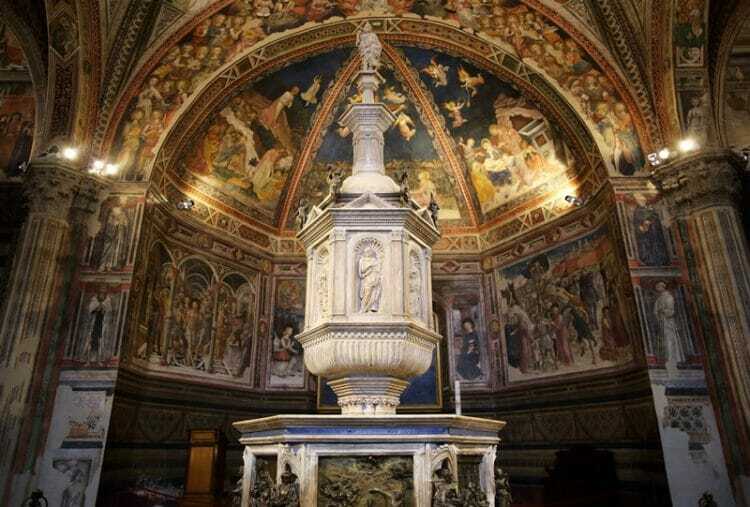 Along with any Cathedral in Italy is the Baptistry. The marble baptismal font is the centerpiece of the structure, adorned with six gilded bronze panels depicting scenes from the life of St. John the Baptist. 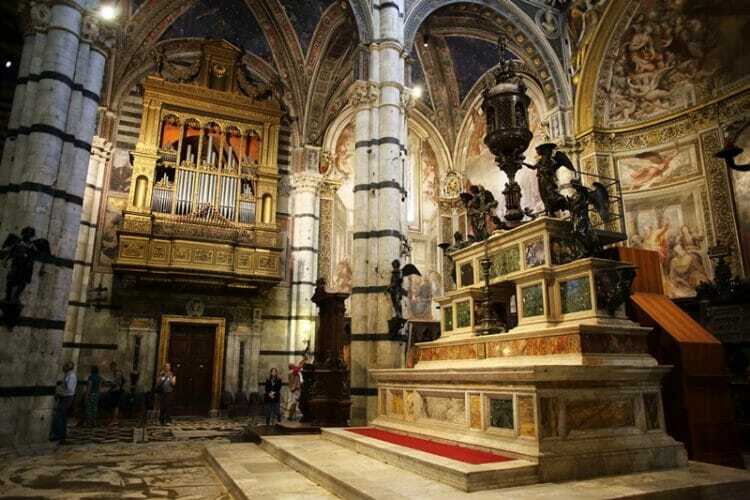 The monuments of Duomo di Siena shut between 5 PM and 7 PM depending on the season, so check here for specific opening times. That’s it! 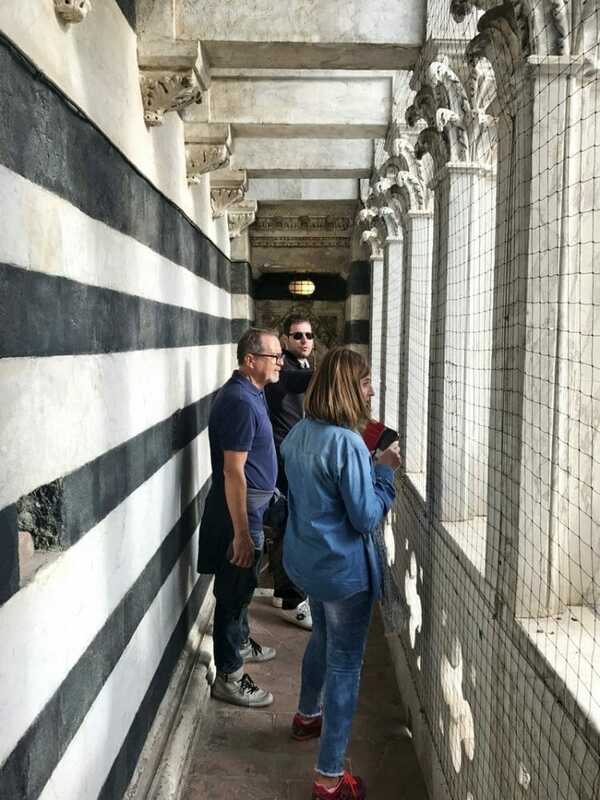 Start walking over to San Domenico (it will take 5-10 minutes) from the Baptistry and grab yourself some homemade gelato from The Masgalano Gelateria (they even have vegan options) while you wait for the bus back to the train station. 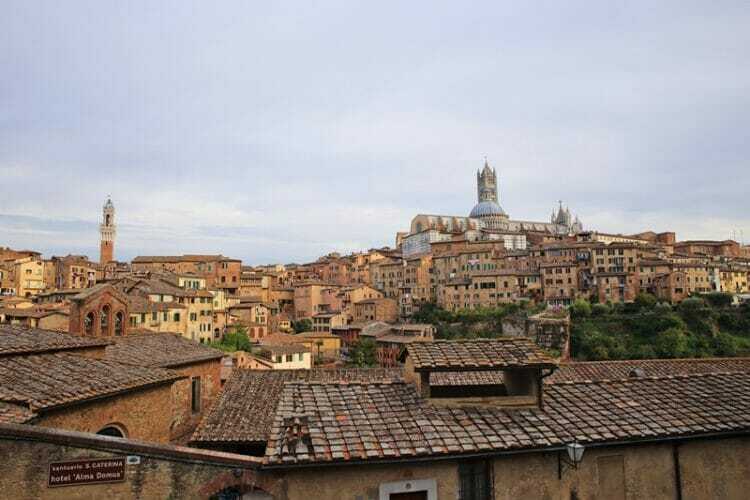 If you arrived in Siena by bus, instead head back to Viazle Tozzi/Piazza Gramsci (another few minutes on foot away from San Domenico) to catch the express bus back to Florence. On the right hand side of San Domenico is a winding path that offers a beautiful of the Duomo and Torre del Mangia from afar. Stop here for a hot second for a lingering last glance of Siena! 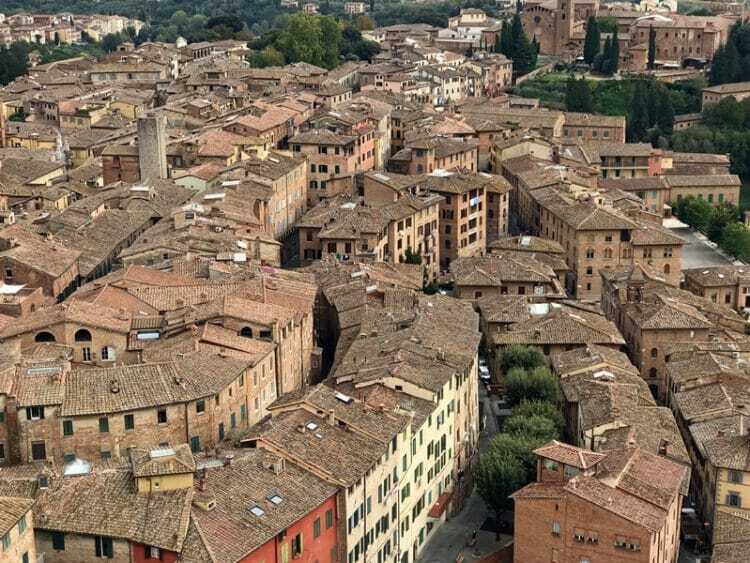 Have a few more days to spare in Siena? Palazzo Salimbeni, Fortezza Medicea, or the Castello di Monteriggioni outside of Siena city. 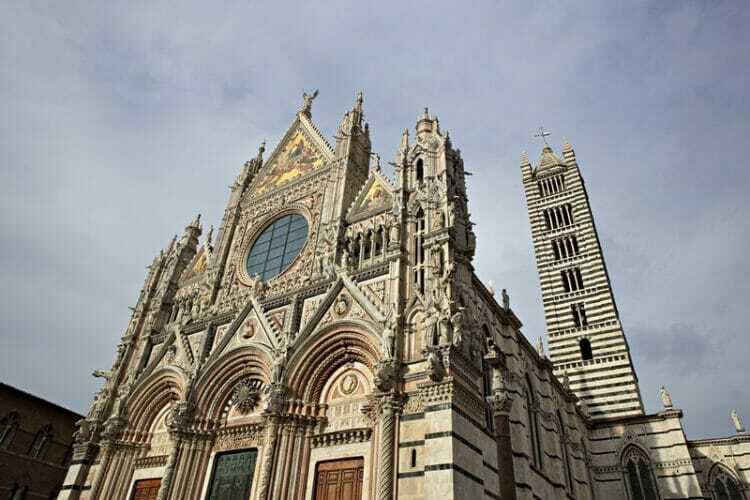 This 1 day Siena itinerary will give you a good taste of what this medieval Tuscan city has to offer. You an also venture over to the wine region in Tuscany to try stunning Italian wine – head on over here to read more about the Tuscan wine region and other stunning wine destinations around the world! 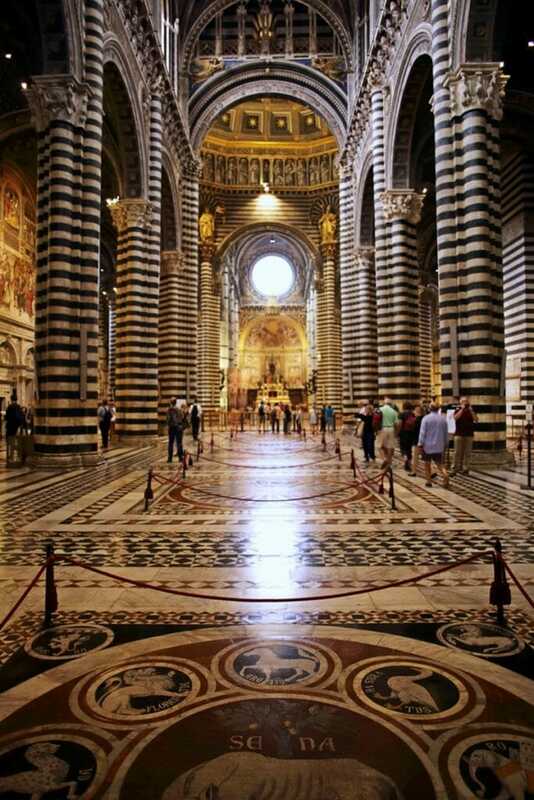 Have you been to Siena before? Tell me all about it below! Looking for even more Italy travel guides and tips? Click here!